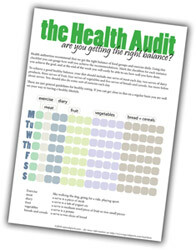 The 'Health Audit' — are you getting the right balance? Health authorities recommend that we get the right balance of foods and exercise daily. 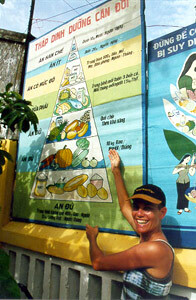 There are many different formats of 'healthy eating guidelines'. We have tried to incorporate all of these into an easy to follow checklist, called 'the Health Audit'. This 'Health Audit' checklist is designed for you to gauge how well you achieve these recommendations on a daily or weekly basis. If you can get close to following the guidelines on the Health Audit on a regular basis you are well on your way to living a healthy lifestyle. The dietary recommendations on the Health Audit are based on the 1,2,3,4,5+ tool, summarized below. Detailed information about 'serve sizes' is written on the printable PDF sheet. 5 or more serves of breads and cereals. You should also do some form of exercise every day. Yes, it really is FREE! Enter your email and you will be directed to a page where you can download the file. A healthy diet is about enjoying a wide variety of foods from all the food groups which will help you enjoy every meal, as well as allow you to meet your nutrient needs from a range of good food sources. Each different food group contains a distinct combinations of macronutrients, fiber, vitamins and minerals, which help to keep us healthy and prevent lifestyle diseases. The aim of this program is to print out the worksheet, stick it on your fridge at home and mark the checkbox for each instance you achieve the goal. At the end of the week, the summary will easily indicate how well you have done. If any of the group targets were not met it may indicate that you are missing out on some essential nutrients in the diet. For example; if the Dairy target is not reached, essential calcium may not be getting into your bones to strengthen them; if the Vegetable target is not being met, it may indicate that fiber is lacking in your diet, or that your intake of folate, which can help prevent heart disease, is inadequate; if the Breads and Cereals group is not being met, it may indicate that you are not getting enough nutritious carbohydrates for energy, or B vitamins required for energy production. If one day you exceeded the target, and the next you didn't meet it, then on average you may be doing OK, so making a summary of the week might better indicate if you are meeting these nutrition goals. If you do not regularly achieve the balance you might suffer from poor energy levels and lack of vitality on a daily basis, and even worse if you always miss the mark you are at risk of suffering from conditions such as diabetes, osteoporosis, iron deficiency, heart disease and some forms of cancer. Please Note; These are just general guidelines for healthy eating and not a diet prescription. If you can get close to this on a regular basis you are well on your way to having a healthy diet and a healthier lifestyle. If you require specific advice about weight management, iron deficiency, cholesterol reduction or other medical concerns, you should seek professional help from a qualified dietitian about more personalized dietary goals. The breads & cereals target of 5 is for a fairly inactive person or someone who is trying to lose weight. You should be aiming to eat more if you have a larger frame or are quite active, and again seek dietary assistance from a professional if you are following an exercise training program. Make your meals as colorful as possible to increase the nutrient variety. Use an array of colored vegetables and fruit, different types of meats, and a range of dairy options, rather than the same options all the time. If you don't like a particular food, try it again and again. Taste buds change over time and you may like it one day. Try to snack on foods that you may not eat at main meals, e.g. fruit, fruit bars, dried fruit, yogurt, milkshakes, crackers, vegetable sticks and nuts. Plan your daily intake to include all the food groups – don't just leave it to good luck. Try some new and interesting foods every day that you have not tried before. Variety is the Spice of Life!! sign up for our newsletter and get your copy of the health audit now!